You probably know that you shouldn't wear white to certain events. You know the cardinal rule about weddings, don't wear white unless it's your own. Then there are the times you don't want to wear white because of the logistics. Don't wear white when you're gardening, cooking tomato sauce, or struggling through the zombie apocalypse. We get that you probably can't plan ahead for an outbreak but we're just saying, white leggings will flaunt all the blood and guts that you don't want to think about. So if you're wearing your summer whites and you hear that there are people turning on each other in the streets, change out of any heals and change into casual colors. Or, start out in these bloody leggings so that the inevitable ugly muss simply blends in! 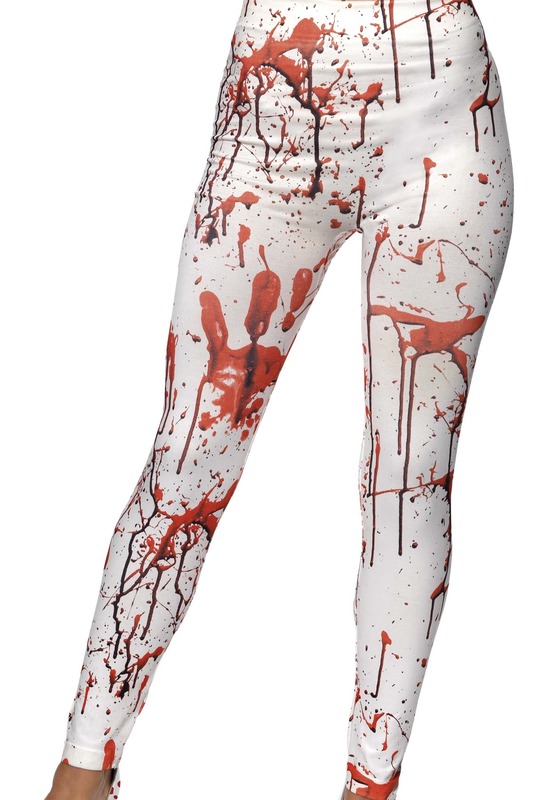 These blood-splattered tights are an excellently gory accent for Halloween costumes from that evil nurse costume to zombie outbreak ensembles. With a little stretch and shining white and red, you'll feel comfortable and on-theme as soon as you slip these on. Are you ready to embrace your gory side? While we wouldn't suggest wearing these leggings to a wedding (that ol' white wedding rule), we think these will be the show-stopping accent for a great scary Halloween costume!